Amazon has got JustForKids Kids Garden Tools Set (including a rake, spade, hoe and leaf rake) for $12.75 with free Prime/SuperSaver shipping. It got 4.5 out of 5 stars over 391 customer reviews and is an Amazon #1 Best Seller. Enhanced binding technology between the metal head and wood stick to ensure two pieces won't fall apart. Stronger & thicker metal head applicable for older kids to play. Extra protective cap applied on all four pieces to ensure extra protection for kids. Each tool is up to 27.5 inch height. Handles are made of solid wood. Heads are made of real metal. 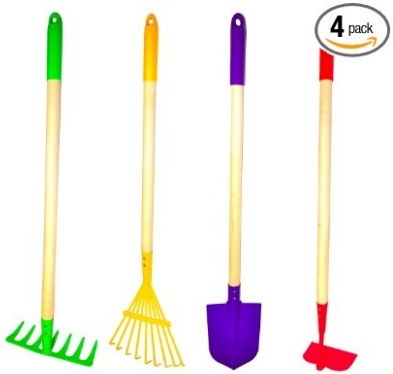 Package includes: shovel, rake, hoe and leaf rake. Ideal for your little ones to work around Mom and Dad in the yard. Adult supervision recommended, age 7 and up.